Fielders gloves and first base mitts are measured by starting at the top of the index finger of the glove down the finger along the inside of the pocket and then out to the heal of the glove. A flexible tape measure has to be used, not a stiff ruler. Measure from the highest point on the glove (normally the index finger). Lay the tape measure across the palm of the glove, so that it folds across and into the indenture, down to the heel of the glove. Higher quality baseball gloves and mitts are usually distinguished by higher grade leather, better construction and better design. These work together to produce a glove or mitt that is durable and helps the ball into and out of the pocket. The highest quality gloves are usually made of heavy leather that will need some time to break-in and typically do not have palm pads or Velcro adjustments. Most manufacturers agree that a glove oil or leather conditioner cream should be used as long as it does not contain silicon. Most manufacturers recommend not using anything that requires a microwave or an oven. The main difference between baseball gloves and mitts is that gloves have fingers and mitts don't. Mitts tend to do a better job of controlling balls that don't hit in the pocket and can aid scooping ground balls and short hops. First base and Catcher are the only positions allowed to use mitts. Baseball gloves and mitts that are specified as women's or female are usually designed with narrower finger stalls and smaller wrist openings to provide a better fit. Youth baseball gloves and mitts typically are designed to be easy to break-in and will sometimes have a notch in the heel to help the glove break-in correctly. These gloves are usually designed with smaller finger and wrist openings to better fit smaller hands, and often have over-sized pockets to aid youngsters learning how to catch. Most first base mitts are designed for baseball use and are 12 to 12 1/2 inches. First base mitts have a thin but stiff pad that runs around the circumference of the mitt and little or no padding in the palm or finger area. Larger baseball first base mitts can be effectively used by softball players. Some manufactures will make softball specific first base mitts. These are usually 13 inches or larger and are not very common. Many softball first basemen use a 13 to 14 inch softball outfield glove at first base. 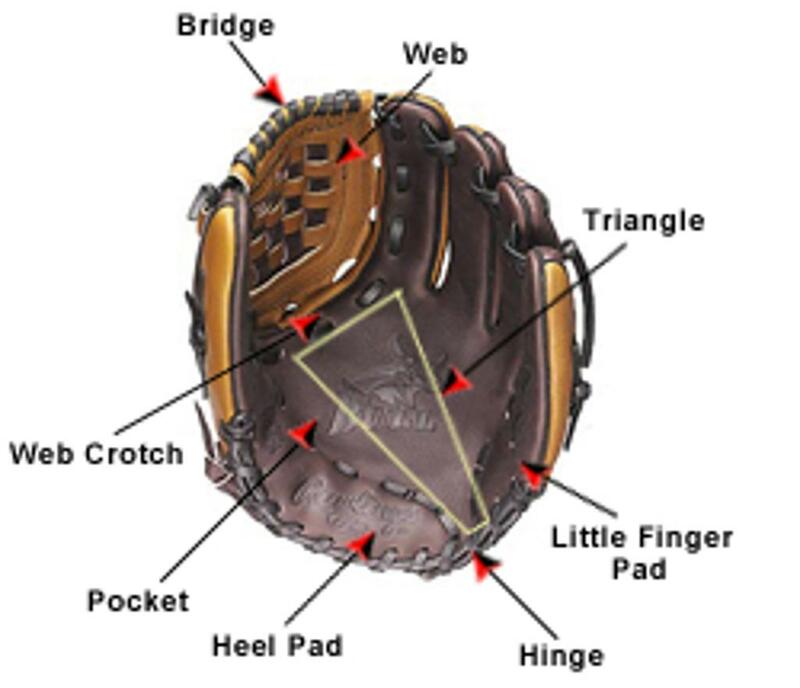 Baseball catcher's mitts usually have a very thick pad around the circumference of the mitt and thick padding in the palm and finger area and a small pocket. Softball catcher's mitts are similar to baseball catcher's mitts except the with less padding and a much larger pocket. For most positions, an open web vs a closed web is a matter of personal preference. Open web gloves tend to trap the ball a little better than closed web gloves. Closed web gloves tend to get the ball out of the pocket a little quicker. First and Third base players tend to prefer open web gloves. Middle infielders tend to want closed web gloves to help get the ball out of the glove quickly. Pitchers usually want closed web gloves so they can hide the ball easier. Conventional (open) vs closed back is mainly a matter of style and personal preference. Conventional back gloves tend to be a little lighter and can fit a bit tighter in the wrist. Some closed back gloves have straps with Velcro that allow you to adjust how tight or loose the glove fits. A good glove does not have to be expensive. There are gloves that will give many seasons of satisfactory service for under $75. You can pay more, but more money does not necessarily mean a better, more serviceable glove. There are expensive gloves ($100-$200+) which may last one or two seasons, and there are inexpensive baseball gloves that can last for ten years or more with routine maintenance. The more expensive gloves do tend to use better (often heavier) leather than less expensive gloves. All things being equal, with careful maintenance, the higher quality glove should last longer. The question is "is the more expensive glove worth the price"? Select a glove for the position you will be playing most often. A glove should feel fairly snug when adjusted. Check to make sure the glove adjusts to your hand. Allow room for batting glove if you wear one. Except for pitchers, most players should wear a batting glove inside their fielders glove. The batting glove will absorb most of the sweat from your hands, thus protecting the lining of your glove. Change the batting glove when it gets wet or rotted. The leather should be fairly sturdy. A stiffer glove will have to be broken in, but once done, the glove will be serviceable for many seasons. The softer "pre-broken" gloves feel great, but many of them wear out very quickly and may be difficult or impossible to repair. The leather in the pre-broken gloves is usually thinner and therefore weaker than that in a sturdier glove. The thinner, softer leathers tend to show signs of stress at the lacing holes in the web and fingers after a few months of continuous play. Manufacturers usually tout a glove's materials whenever they are made of something considered "premium" enough to provide a selling point. If a glove is made of full-grain leather or premium steerhide, the two top grades, the manufacturer will definitely print that fact prominently on the glove. Top-quality leather makes the best gloves, but the reality is, for a kid's glove that will be outgrown and discarded after a few years, premium materials are nice but not crucial. The original method of turning animal skins into leather is known as "vegetable tanning," which means the skins are tanned with tree bark or tree-bark extracts containing tannin. Vegetable-tanned leather undergoes a lengthy tanning process that results in a leather that is flexible and has superior moldability. The other primary method of tanning is called "chrome tanning," in which the skins are tanned with mineral salts. Chrome tanning can be done in a fraction of the time of vegetable tanning, and results in a stronger, more abrasion-resistant leather. Almost all baseball gloves today are chrome tanned leather. "Oil tanning" is a specialized process that is rarely seen today, and is used exclusively in split leathers such as chamois and buckskin. Buffalo skin is used by only one manufacturer, Nokona. Buffalo skin is said to be tougher and lighter than full grain steer hide, but breaks in just as easily. Most people aren't going to want to get a Little Leaguer a buffalo skin glove because of the high price, but if they want to, it's out there. "Full-Grain" leather is steer hide or cow hide leather on which the entire natural grain remains. It will either be the original thickness of the skin, or the bottom grain will have been sanded off until the leather is the desired thickness. This grade is uncommon in youth gloves, but is readily available in premium adult gloves that come in sizes suitable for older Little Leaguers. Although in theory full grain leather can be any weight, in practice, gloves made of full grain leather tend to be stiffer and heavier than other types, and require longer break-in periods. These leathers are rarely pre-oiled, because the players who buy gloves of this quality usually want to apply their own particular break-in method. Once broken in, full grain leather gloves are superior in both performance and durability. Catchers' mitts are almost always made of full grain leather or premium steer hide. "Top-Grain" leather" is a misnomer; it is usually leather in which the "top" grain (the fur side) is sanded off until the leather is a desired thickness, and then filled or treated, where an artificial grain is introduced, usually by pressing. Many baseball gloves probably are top grain leather, but the manufacturers may not always use the phrase to describe the leather. Often they use a brand name instead. Nokona is the only manufacturer that says its gloves use "top grain leather." In Nokona's case, the leather is heavy weight and very durable. Wilson's "Quick-Stop" leather is also a top grain leather, but it is medium weight and has average durability. Steer hide, which comes from neutered bulls, is somewhat stronger than cow hide. Manufacturers are free to call any steer hide "premium," but in practice they reserve this designation for their better grades of heavy weight steer hide, usually top grain, occasionally full grain. Gloves made of this leather tend to be stiff and somewhat heavy, with longer break-in periods. These leathers are sometimes pre-oiled. Many manufacturers have gone away from premium steerhide both because the market now demands softer gloves, and to save money because few consumers know the difference. "Leather" means cow hide, usually medium weight, but sometimes heavy weight. This category encompasses the greatest range of quality. Cow hide performs well, and will break in faster, but also wear out faster than steer hide. Usually this grade will come "pre-oiled" or otherwise treated to reduce break-in time. Cow hide is probably the best all-around choice for a youth glove for ages 10 and up. There are many good Leather glove bargains in the $25-$50 range. Kangaroo skin is stronger than steer hide of any grade, and weighs a fraction as much. It is fairly new to the baseball glove market, and what grades are being used is anybody's guess. Some manufacturers use kangaroo only in premium gloves, while others use it only in their budget baseball gloves. Early reports say it breaks in easily but doesn't hold its shape as well as the better cow hide or steer hide grades. Often gloves are made with steer hide or cow hide palms for durability, and kangaroo skin backs for light weight. Pigskin is far less durable than cowhide. However, it is more flexible and breaks in far more easily than cowhide, and costs less. Pigskin gloves are inexpensive, and can be ideal for a youngster who wants a good-performing glove but who may grow out of it in a year. Mizuno gloves are universally well made, even their bargain models. Mizuno's top leather is "Double-Tanned Steerhide." This is a full grain steer hide. It is both vegetable and chrome tanned, which is an expensive process. Most of the rest of Mizuno's lineup is cow hide leather. Mizuno has several leathers, each with its own particular tanning process: "Retro Leather" and "Full Grain Leather" are heavier weight and more durable; "Tsunami Leather," "49er Leather," "Select Leather," and "One-Touch Leather" are medium weight and break in quickly. Mizuno youth models are generally found in their "Prospect" line of gloves, but gloves small enough for youths can be found in many of Mizuno's lines. Rawlings offers a range of gloves priced from budget to premium, and uses a variety of materials, ranging from very good to very poor. Rawlings' top grade is called "Heart of the Hide." It is heavy-weight full grain steer hide that has been "oil-tanned" to greatly reduce break-in time. These gloves are popular with major leaguers. Wilson's top grade of leather is found in their "Pro-Stock" models. It is heavy-weight full grain steer hide. Wilson has a variety of other leather brand names, each with its own tanning process, but the bottom line is all other Wilson brands are cow hide leather. Most Wilson youth models are found in its "Advisory Staff" and "EZ Catch" models, but Wilson makes gloves small enough for youths all the way up to the A2000 models. The EZ Catch models are youth-size gloves with extra-large, pre-broken-in pockets. I recommend the leather versions (avoid the vinyl versions). Easton, traditionally a bat manufacturer, is new to the glove market but has quickly established itself as a top glove manufacturer. Easton's best grade of leather is called "Gladiator" steerhide. Easton makes a very popular "Natural" series of gloves using pre-oiled "Walnut tanned" leather. It is difficult to tell from Easton's press releases, but the "Walnut tanned" leather may be a vegetable tanned leather. Louisville Slugger's top brands are designated "TPX." TPX's top grade of leather is called "Maruhashi", which is roughly comparable to "premium steer hide". Nokona is a premium glove manufacturer whose roots extend to the dawn of baseball. Nokona makes gloves out of top grain leather, cow hide, combinations of kangaroo and top grain or cow hide, and the ultimate in glove material: buffalo skin. Nokona's buffalo skin gloves, if you can find them, command prices over $250. Nokona's kangaroo-skin hybrid gloves are the next most expensive; they command a premium price over even the top grain models. Nokona "top grain leathers" are heavier and slightly more expensive than their "cow hide" gloves. Nevertheless, Nokona's cow hide gloves are heavy weight, and are generally considered equivalent in quality to other manufacturers' steer hide or even premium steer hide gloves. Nokona's leathers are "vegetable-tanned". Nokona is unique among glove manufacturers in that you can order a particular glove pattern with a choice of open or closed web, and often with a choice of the leather as well. Apply a small amount of Glove Oil in the triangular area shown. Rub it into the leather until most of it has been absorbed, then wipe off the excess with a soft towel. Next, fold the glove at the hinge and excercise that area a bit. Then, fold the glove and squeeze the fold so that a crease can be formed along the triangle line from the index finger side to the hinge. After setting this crease, re-fold the glove and form a similar crease from the thumb side of the triangle to the hinge. The final step is to re-fold the glove so a crease can be formed from the center of the web crotch to the hinge. When finished with these steps you should be able to see three distinct creases fanning out from the hinge to the web crotch. After completing these steps (about 20 minutes) put the glove on your hand and close it a few times. You should be able to feel a difference in the way the glove responds. Repeat this procedure in a few days, but do not use the glove oil in excess. The most important part of caring for your glove is to recognize that leather will deteriorate if subjected to repeated exposure to moisture and heat. Saliva will also result in damaged leather, so Don't Spit In Your Glove. Leaving yourglove out in the weather will ruin it, as will putting it away wet from perspiration. Always wear a batting glove under your baseball glove (except for pitchers) - this absorbs the sweat from your hand. When your batting glove gets wet, change it. This will add years to the lining of your glove. When your glove gets wet, dry it with a towel or soft cloth, and leave it exposed to room air for a few hours until the lining is dry. After it dries, use a little glove conditioner to moisten the leather. When you put your glove away, put a softball in the pocket and wrap it with a wide rubber band.